Neodymium, atomic no. : 60, symbol as Nd, weight at 144.24, is the most abundant of the rare earths after cerium and lanthanum. It shows similar characteristics to the other trivalent lanthanides. The neodymium-based magnet was first introduced in 1982 simultaneously by Sumitomo Specialty Metals (Japan) and General Motors (USA) and commercialized in 1986. It is used extensively in the automotive industry with many applications including starter motors, brake systems, seat adjusters and car stereo speakers. Its largest application is in the voice coil motors used in computer disk drives. 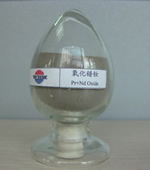 Neodymium is included in many formulations of barium titanate, used as dielectric coatings and in multi-layer capacitors essential to electronic equipment. Yttrium-aluminum-garnet (YAG) solid state lasers utilize neodymium because it has optimal absorption and emitting wavelengths. Nd-based YAG lasers are used in various medical applications, drilling, welding and material processing.